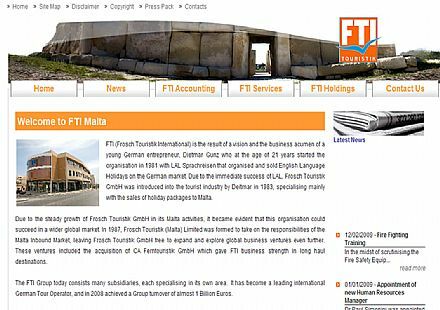 FTI has entrusted us with the development of 4 websites â€“ FTI Malta, FTI Accounting Services Ltd., FTI Services Malta Ltd. and FTI Holdings Malta Ltd which are all administered from the same backend. FTIMalta.com is the main site of FTI. The FTI Accounting Services website (ftias.com) has as its main aim to give accountancy information to suppliers whilst the FTI Services Malta Ltd. (ftism.com) also holds infomation about the various services it offers including accomodation, excursions, tours and other activities as an inbound agent. The same goes to FTI Holdings Malta Ltd. website (ftihm.com) which provides outsourced book-keeping and accounting services to small, mid-size and fast growing businesses predominantly within the FTI Group of Companies. On all FTI websites, Abakus Solutions developed and implemented the Vacancies Section. This enables FTI to advertise any vacancies within the respective companies. The websites includes all the information that one would need when seeking FTIâ€™s services. Visit the websites through www.ftimalta.com.